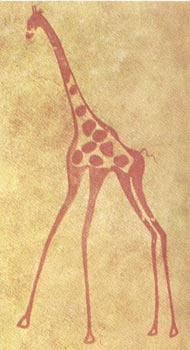 Sahara Giraffe from circa 5000 b.c. Ancient cave paintings in the Tassili n'Ajjer mountains of southern Algéria show that the Sahara Desert was considerably more lush and hospitable between 5000-10,000 years ago. "Most of North Africa is covered by the desolate sands of the Sahara Desert; but this region has not always been a desert. In prehistoric times this area was quite fertile, and was the home of a fairly advanced culture. A pioneer in the study of this region was Professor Leo Frobenius. In exploring many caverns in North Africa, Frobenius found numerous frescoes, ceramics, statues, and ideograms. Some of the paintings found in these caves are of considerable artistic merit. Among them are pictures of extinct birds and other animals. The paintings show elephants and buffaloes of a larger size than our contemporary species, and thus give us an idea of their great antiquity. Another great discovery of the North African past was made in 1933 by a young French army officer, Lieutenant Brenans. This soldier was on a mission that led him to the Tassili-n-Ajjer Plateau in the Central Sahara; and, while preparing to spend the night in a cave, he noticed a drawing of a giraffe on a wall. After scraping off a film of dust encrusting the figure, Lieutenant Brenans found himself gazing at a fine painting done in colors by some prehistoric artist. The next morning, neighboring caves and rocks were examined; and many other drawings, dating back to a remote past, were discovered. Brenans made sketches of the ancient drawings and sent them to Paris. The response was most gratifying; for an expedition was organized in Paris, which set out for the Sahara. Among the leading scientists in the party were Professors Gauthier, Reygasse, and Perret, and last, but not least, a young anthropologist, Henri Lhote. After six weeks of exploring, the professors returned to France, leaving Brenans and Lhote to continue the work. The rock paintings of Tassili-n-Ajjer showed that eight thousand to nine thousand years ago the Sahara region was not a desert, but a fertile territory of grasslands, forests, and rivers, inhabited by antelopes, giraffes, elephants, crocodiles, hippopotami and rhinoceroses. The human inhabitants seem to have been hunters and pastoral people. . . On some of the rocks were as many as sixteen layers of drawings. This could only mean that the area sheltered human inhabitants over a period of thousands of years. The drawings show that hunting tribes were succeeded by herders accompanied by their flocks of cattle. In many paintings are scenes of primitive rituals of a magical or religious nature."